Some films are accessible to a very broad audience, others not so much. Girls' Trip is designed with a rather specific demographic in mind and as such, despite a so far very high aggregate review score from the US, its appeal is limited. 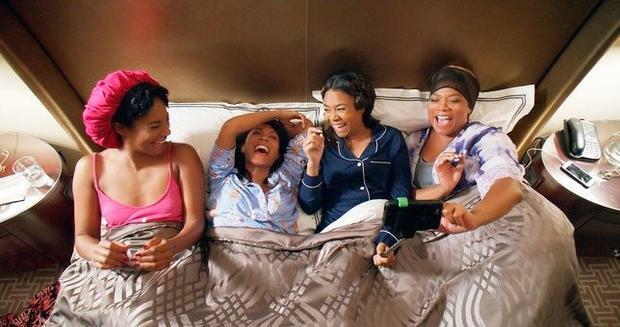 It's a fairly ribald comedy about four middle-class, middle-aged African American ladies rekindling their college spark. The humour is very love-it-or- hate-it, ribald as I said, and a bit contrived, but it has great heart, the characters are likeable, well-delivered and their friendship feels authentic. It's just too long. Ryan (Regina Hall) has built a successful self-help career, part of which is her perfect marriage to Stewart (Mike Colter). She laments how time and life have weakened the bond between her and her college pals so when she is invited to be keynote speaker at the Essence event in New Orleans, she invites them too. Enter serious journo-turned-gossip blogger Sasha (Queen Latifa), party girl-turned-mother earth Lisa (Jada Pinkett Smith) and unreconstructed wild girl Dina (Tiffany Haddish). The Flossy Posse is reunited. We can probably thank the success of The Shallows last year for taking this film from its original straight-to-DVD destination to a cinema release instead. In the US this latest survival thriller has done rather well for, although deeply flawed, and occasionally ridiculous, it is rather watchable. Lisa (Mandy Moore) is the super-sensible sister who takes her fun-loving adventurous sib Kate (Claire Holt) on a trip to Mexico. It soon emerges that the reason for this largesse is that Lisa has just been dumped by her boyfriend who says she is boring. On a night out they meet two local boys who describe the joys of shark watching from a cage. Kate convinces a very iffy Lisa that it would be the best way to prove to her ex that she is not boring at all. Next morning they meet Taylor (Matthew Modine channelling salty sea dog) and head out to his battered boat complete with vaguely intimidating local. So far every cliche ticked and there will be more because the writing is not this film's forte. The dialogue is dodgy and where the art is meant to lie in showing not telling, they show and tell. Still it works on levels when the sisters' underwater cage sojourn goes horribly wrong and the sharks are only one of their worries. Stop me if you think you've heard this one before: sensitive, misunderstood literary type in grimy England defies calls that he's a no-hoper and rises to rock stardom. England Is Mine, a biopic of The Smiths' mouth-in-chief Morrissey, should be an exercise in by-numbers rock hagiography for the big screen. What makes writer-director Mark Gill's debut interesting is that it is not. Nine-year-old orphan Ren (Aoi Miyazaki) accidentally strays into the magical world of humanised beasts that exists on the flipside of the city of Shibuya in Japan. Only a rare human can access it, and it is anger that allows Ren in. There he meets Kumatetsu (voiced by Koji Yakusho), a rough but skilled warrior who is one of two possible successors to the Grandmaster. The other is Iozen, a flash and most popular creature who strongly opposes Kumatetsu's plan to take the human boy, renamed Kyuta, as an apprentice. But apprentice he becomes and boy and beast forge a reluctant bond, each learning from the other, in the company of a monk and monkey. Kumail (Kumail Nanjiani) is a stand-up comedian trying to break through so he can ditch his job as an Uber driver. He gets heckled one night by Emily (Zoe Kazan) and a tentative romance slowly develops. As befits any self-respecting rom-com, outside forces threaten to get in the way of love. In this case, it is Kumail's traditionalist Pakistani family who are starting to get pushy about arranging a marriage to a nice Muslim girl of their choosing. The triviality of this issue is brought into sharp focus when Emily takes ill, is put into an induced coma, and confined to a hospital bed. While she had never met Kumail's parents, he is now put face-to-face with hers and is forced to take a long hard look at himself and his feelings. Nanjiani co-wrote the screenplay to this charming comedy with wife Emily V Gordon, applying both rom-com tropes as well as crafty genre subversions to the story of their own romance. This personal, lived-in feel is one of the strongest selling points of Michael Showalter's film, and the reason it is making such a strong connection with audiences. Don't be surprised if the humour feels strikingly similar to Judd Apatow's flaky, loosely-strung comedic style - Apatow produces here, which, you suspect, may also have played a role in The Big Sick being a good half hour too long. But as the film straightens its course after a very indie-shmindie opening third, its formidable strengths begin to rise steadily to the surface.